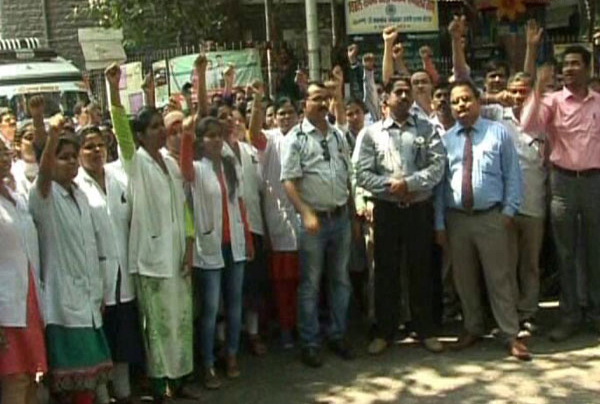 A group of doctors took out a protest march from AIIMS hospital to Parliament on Tuesday against the National Medical Commission Bill, 2017. New Delhi: A group of doctors took out a protest march from AIIMS hospital to Parliament on Wednesday against the National Medical Commission Bill, 2017. The bill, which seeks to replace and subsume the Medical Council of India (MCI) with a new body, was tabled in the Rajya Sabha in January by Union Health Minister J.P. Nadda. According to the bill, practitioners of Ayurveda, Yoga and Naturopathy, Unani, Siddha and Homoeopathy, can practice modern medicine once they complete a short-term "bridge" course. The bill is also aimed at bringing reforms in the medical education sector which has been under scrutiny for corruption and unethical practices.